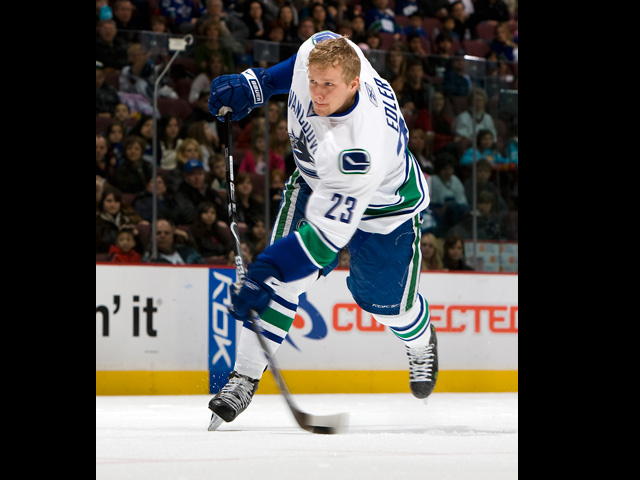 Members of the Vancouver Canucks faced their toughest opponents of the season Saturday afternoon at GM Place as they battled each other in the annual Canucks Superskills event. In partnership with McDonald’s, the Superskills competition gave fans the opportunity to see the Canucks face off against each other, and once again this year, it didn’t disappoint. Split up into two teams, Team Blue and Team White, the Canucks teamed up with Nanaimo's North Island Silvertips as they took part in six head to head competitions that showcased their skill and agility. Events included puck control, fastest skater, hardest shot, accuracy shooting, a breakaway relay and a pass and score drill. Both teams battled hard, but in the end Team White beat Team Blue 15-14 in front of a large, energetic crowd of Canuck supporters. The event kicked off with a puck control relay, with both teams earning a point, before Team Blue’s Mason Raymond showcased his cheetah-like speed in winning the fastest skater contest with a time of 14.283. Raymond narrowly beat out former Manitoba Moose teammate Mike Brown, who ripped around the ice in a time of 14.322. It wasn’t all roses for Raymond following his win though, as Alex Burrows gave him an official welcome to the team with some rookie hazing. Burrows targeted an unsuspecting Raymond with some dessert as he kept the Canucks tradition alive. 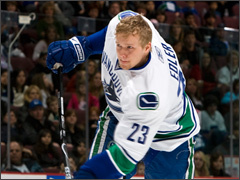 The hardest shot competition was up next and as usual Sami Salo performed well, but the four-time defending champion, who put up a speed of 98.5 MPH, was outdone by Alex Edler of Team White. He posted a speed of 99.3 MPH on his second shot, after breaking his stick on his first attempt. Daniel Sedin, known for his pinpoint scoring touch, destroyed four targets on four shots to win the accuracy shooting challenge for Team White. 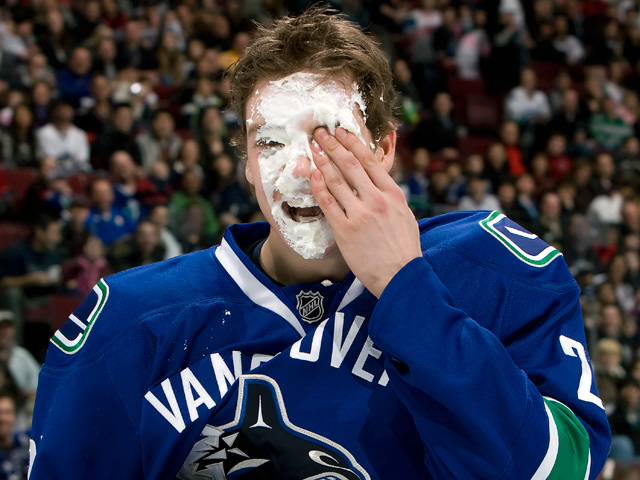 Team Blue’s Markus Naslund also hit four targets, but it took the Canuck captain six shots to do so. Roberto Luongo was in net for Team White for the pass and score drill, an event where three players have 30 seconds to go in alone with the only rule being that they must make at least two passes and each player has to touch the puck. Luongo was impressive as he turned aside three of the six shots, but he was outperformed by Curtis Sanford, who stopped four of six shots to capture a point for Team Blue. The breakaway relay closed out the afternoon and helped Team White escape with the one-point win as the teams were tied at 11-11 heading in. Mason Raymond, Alex Burrows and Matt Cooke were among the scorers for Team Blue, while Jason Jaffray, Daniel Sedin and Willie Mitchell scored for Team White, preventing Team Blue from winning their second consecutive Superskills challenge. 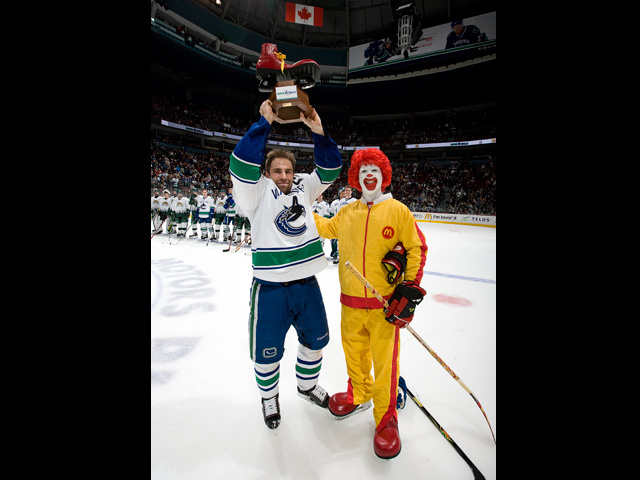 Team White was awarded the coveted Ronald McDonald shoe following the challenge, before both teams posed for a picture with the North Island Silvertips at centre ice. The Superskills challenge, which also included face painting, pictures with Fin and the opportunity to see the Stanley Cup, was another rousing success as the players put on a great show, but it was the players themselves that were most impressed with the fan support. Net proceeds of the event will go to the Canucks for Kid Fund, Ronald McDonald House British Columbia and the NHLPA’s Goals of Dreams Fund.